Europe’s Energy Crisis Poses Warning for the U.S.
Europe has a problem that may soon become ours. Countries including Germany, Spain, and England are finding that their recent “green energy” experiments are proving too costly to continue. Between 2005—when the European Union adopted its emissions trading scheme—and 2014, residential electricity rates in the EU increased by an average of 63 percent. In Germany, rates increased by 78 percent; in Spain, by 111 percent; and, in the U.K., by a whopping 133 percent. Over the same decade, residential rates in the United States rose only 32 percent. 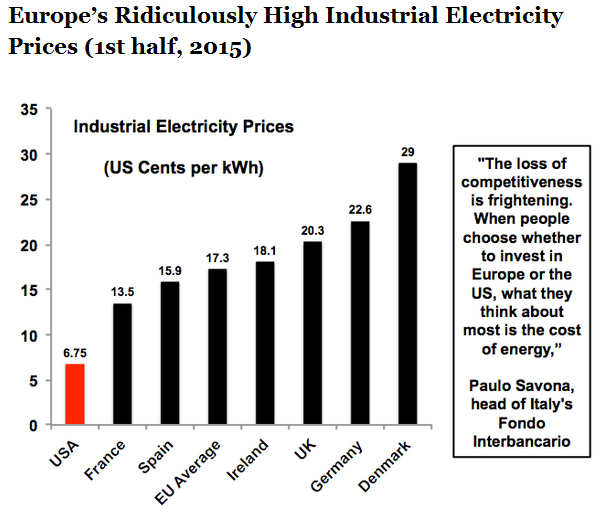 Across Europe, the cost of electricity has been rising, thanks to a well-intentioned but mistaken plunge into “renewable energy.” And what’s happening in the EU portends a troubling lesson for the United States. Simply put, green energy is proving to be an expensive failure. Yes, green energy works when heavily subsidized by the taxpayer. But Europe’s taxpayers can no longer afford the experiment. What did our European friends get for their exercise in green energy exploration? Power shortages, job loss, and the bankruptcy of major green energy giants like Spain’s Abengoa, which received more than $2 billion in loan subsidies from the Obama Administration. In fact, Spain is now confronting $27 billion in debt from failed wind and solar projects, thanks to a program estimated to have eliminated at least two jobs for every “green” job it created. This isn’t the picture that renewable energy activists like to trumpet when praising wind and solar power. Germany’s activists proudly talk of renewables powering a record 78 percent of the day’s energy needs on July 25, 2015. It sounds breathtaking, but the fine print is more relevant. Three days before, the same renewables powered only 25 percent of energy demand. A more accurate picture emerges the closer one looks at Germany’s actual experience. On the recent afternoon of April 4, 2016, for example, the data show production of only 2.23 GW of wind power, 0 GW of solar, and 46.48 GW of “Conventional” energy. That conventional energy comes mostly from coal plants, which still generate roughly 40 percent of total German electricity. There are several lessons here for the Obama Administration. First, wind and solar will always require back-up power from gas, coal, and nuclear plants. That’s because the wind doesn’t always blow and the sun doesn’t always shine. Second, renewables are expensive, because they require standby support from gas, coal, and nuclear. Third, any effort to rely on renewable energy as the primary source of power is simply not feasible. Unfortunately, the Obama Administration continues to ignore the evidence. The president’s “Clean Power Plan,” which hopes to install 125,000 wind turbines nationwide while eliminating 40 percent of America’s coal fleet, means a blind leap into the same green chasm. The Clean Power Plan is projected to raise consumer utility costs $214 billion by 2030, with another $64 billion needed for the installation of renewables infrastructure. The Administration ignores who will be hurt the most by such cost increases. U.S. manufacturers will suffer when competing with countries like China that enjoy cheaper energy. And America’s low-income communities will certainly be hurt by higher residential electricity costs, leaving them with less discretionary income for essential services. Unfortunately, environmentalists continue to disregard the state-of-the-art technology now employed at U.S. power plants to trap and scrub coal emissions. But this clean coal approach works. And the same technical innovation can capture carbon dioxide, just as it has cleaned coal of conventional pollutants. Given our nation’s technological prowess and world-leading coal supply, clean coal should be a logical option if America’s goal is safe, reliable, affordable power. Let’s hope America learns quite soon to embrace clean coal. 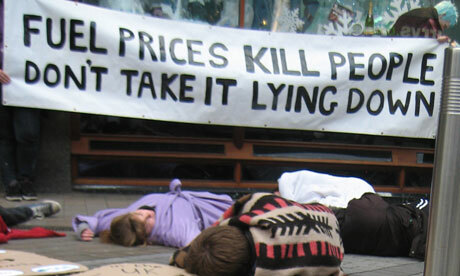 Otherwise, the alternative will be the heavily subsidized model of renewable energy now provoking a crisis in Europe. We reproduced Don Aitkin’s blog post as an example of how thinking shifts as facts about wind and solar power start to gain traction. We concur in your opinion about wind power. However, we are waiting for a concrete (ie sensible) definition of what climate change means on planet that has seen a massive range of climatic variation over 4.6 billion years. The world’s climate was never static, so why should it cease to change now? Without a meaningful definition, arguments about causal factors are scientific fallacy. Anyone pushing AGW as a threat ought to be backing nuclear. If not, they can’t be taken seriously. Some of the best and most informed factual papers on this subject, peace to you, : ). You might be interested in a material about to be produced in Victoria that can, among its other attributes, capture and break down so-called ‘greenhouse’ gases – the very things those of the ‘green’ persuasion fondly imagine that windmills and solar panels can achieve, although not without huge subsidies! And I think I can promise you a laugh once you discover from whence this magic stuff derives! So we will be able to convert a supposed ‘problem’ into a non-problem! By the way, this stuff can also fix the diesel emissions problem, and the result is a fine fertiliser! What! Do you mean that this is ‘green’? Take a look and see for yourself ….. Anyone want to get in touch, feel free. Happily, the project is now funded and under way after a number of years of effort….